What makes us extraordinary is that we operate an on-campus museum and house a permanent collection of fine art. ELAC is one of the very few community colleges in the U.S. with a major art collection, and since the opening of the new Performing and Fine Arts Center in 2011, we have one of the most impressive facilities to house our museum and its collection. In fact, Vincent Price Art Museum (VPAM) has had a presence on this campus for more than fifty years. In 1951, Vincent Price—noted actor, collector and one of Los Angeles’s great champions of the arts—made his first visit to ELAC. 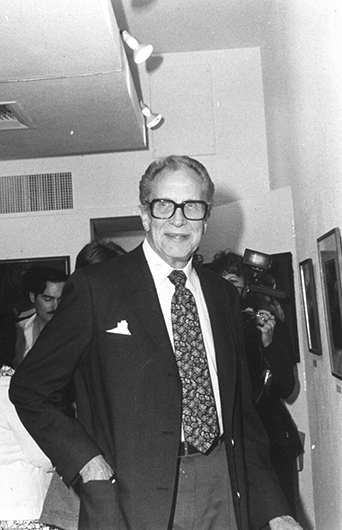 Together with his wife Mary Grant, Vincent Price was a frequent visitor here, a speaker at graduation ceremonies and a classroom guest who eagerly engaged with our students and faculty. As he got to know ELAC, Mr. Price noticed a lack of opportunity for students on this campus–and in East LA in general–to have first-hand experiences with art. The Prices took the initiative to remedy this shortcoming and donated 90 pieces from their personal collection in 1957 to establish the first “teaching art collection” housed at a community college. In recognition of this extravagant gift, ELAC renamed the art gallery in the Prices’ honor. Over the past 50 years, the collection has grown to more than 9,000 objects, and more than 100 shows have been mounted here. The range is impressive and eclectic, much like the Prices’ own collecting interest in world art; African, Mesoamerican, Native American and European artworks have all been exhibited here. The new museum houses seven art galleries which can accommodate temporary rotating exhibitions, student shows, permanent collection shows, and artist and community projects; there is also a specially designed vault for the permanent collection named after long-time Museum Director, Thomas Silliman; and a multimedia lecture hall for art history classes. VPAM is one of three buildings that make up the newly opened Performing and Fine Arts Center at ELAC, designed by the internationally recognized firm Arquitectonica. Three unique buildings – totaling 160,000-square-feet – make up the Center that is the new permanent residence for many campus departments including Music, Theater, Dance, Studio Art, and Art History.